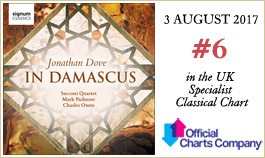 In Damascus is a new song cycle from composer Jonathan Dove which sets, in translation, the words of Syrian poet Ali Safar: a bleak vision of ineffably historical beauty torn apart by indiscriminate war. The work was commissioned by the Sacconi Quartet who also perform here the composer's piano quintet and Out of time, a string quartet in all but name. Even though Jonathan Dove is best known as a vocal or choral composer, with operas and works for children forming the backbone of his output, his chamber music reveals similar predilections for narrative, drama, atmosphere and a sense of the personal. His breakthrough piece, Figures in a Garden (1991), a wind octet based on Mozart’s Le nozze di Figaro, is in essence a small drama without singers, and much of his non-vocal music is inspired by visual, literary, personal sources. Though Out of time (2001) is, to date, Dove’s only ‘pure’ string quartet, he has written extensively for quartet, either as an accompaniment to singers, or in his chamber operas; so in fact, a chamber music aesthetic, whether ‘pure’, or disguised as support for a drama, or a vocal piece, looms large in his considerable output. 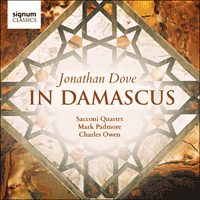 The chamber pieces on this CD are both personal, and with the final vocal piece, In Damascus (2016), politically engaged as well. Though Out of time has no overt musical connection with Mozart, it shares a similar world to Figures in a Garden. Both pieces are made up of a mosaic of short movements, and have a relaxed and benign feel, though the characters in Mozart’s Figaro are replaced, in Out of time, with a single, real person. Dove describes Out of time as ‘a serenade for someone I never met’. The piece, commissioned for the Vanbrugh Quartet, by Mrs Elizabeth Allsebrook in memory of her husband, Peter, is not a musical portrait, but an evocation of someone with life-enhancing energy, and an elegy for his departure. There are six short movements, opening with a rushing, rustling idea that occasionally blossoms into a fragment of expressive melody. The second is, in the composer’s own words, ‘a kind of nocturne in which the gentle pulsings are slightly out of time with each other, like sleepers in the same room’. This is followed by a brief bucolic dance, marked ‘stomping’. The last three movements run together, a jig that reveals a little folk-like melody that dominates in a slow nostalgic conclusion; a more aggressive, but still bucolic movement that leads, by way of the little folk fragment to an elegiac finale, where the folkish melody plays out to a procession of slow moving lines, as an apotheosis. I wanted to write music independent of outside sources. So this Piano Quintet has no programme or hidden story. The bells in the second movement are not the bells of Gubbio; yet, in some way, I suspect that all those summer sensations have coloured this score. The first movement, marked ‘Energetic’ starts with a little piano figure that could be evocative of birdsong, and also playfully refers to the opening gesture of his first big operatic success ‘Flight’. It is a moto perpetuo, with two points of rest, a floating theme interrupts twice, and there is a striking, extended build up from the depths of piano and cello to the extreme top of the range of all instruments. The slow movement is the emotional heart of the piece, starting with a serene threnody that could be a distant and sunnier relation of the famous Adagietto from Mahler’s 5th symphony. This is interrupted by a striking bell like figure in the piano, and these two discrete sound worlds eventually build to a solemn processional. Though Dove disavows a programme for this work, the music is visual and atmospheric and builds to a climax of almost cinematic intensity. The finale is a more rumbustious, straightforward piece, with a catchy tripping rhythm, which though regular, cunningly wrong foots the listener, and it sustains a summery festival mood to a joyous conclusion. I had a purpose (I was writing music for a play about Palmyra’s Queen Zenobia) but essentially I was a tourist. Like any visitor, I was thrilled to step out of the noisy modern city into the magical ancient world of the walled Old City, its vibrant souk leading to the magnificent mosque, and a labyrinth of winding, narrow streets filled with the smell of unleavened bread. In Palmyra, I was met with extraordinary kindness everywhere. On one occasion, a little Bedouin boy noticed that I was risking sunstroke wandering bare-headed among the spectacular ruins: he showed me how to tie a turban, then took me to have tea with his family in their tent. Since then, I have watched helplessly as these places of wonder have been devastated and their inhabitants scattered and killed. I searched for a long time to find a contemporary poet whose work might gain from any music I could imagine. I felt it was important to find first-hand accounts of the Syrian experience—but, of course, I was always reading them in translation. In an anthology called Syria speaks, I was astonished to read something that looked like prose, but was full of poetry. It was Anne-Marie McManus’s fine translation of Ali Safar’s A black cloud in a leaden white sky—an eloquent, thoughtful, contained yet vivid account of life in a war-torn country, all the more moving for its restraint. In setting these words, I have not attempted to imitate Syrian music. However, there is what might be called a linguistic accommodation in my choice of scale, or mode. Several movements are in a mode that I first discovered while writing a cantata commemorating the First World War: it has a tuning that I associate with war, its violence and desolation. This eight-note mode is similar to scales found in Syrian music. I did not choose it in the abstract: it emerged from the harmonies I was exploring in the earlier work, and emerged again as I was looking for the right musical colours to set Ali Safar’s words. The work is in eleven movements, the first opening with a brusque and weary series of dissonant chords for the string quartet: these contain in embryo much of the musical material that follows. Dove’s dramatic mastery is soon in evidence with the opening lyrical recitatives, describing children not waking but floating away—only at the end do the narrator and the quartet vent their anger. The second song And what if you weep alone is an extremely simple lament, with a dragging chordal accompaniment. A weary rising theme depicts refugees queuing to leave the country in the third, which is another variation on the opening chords. The mood brightens in the 4th song: Here and now in Damascus, which shows everyday life proceeding, though it is dramatically shattered by the expectation of new bombs falling. The following number tensely peruses the suffering faces in the crowds, and the tension is further ratcheted up by an instrumental number, which culminates in anguish and dissonance. No 7, Soon, we will be free, is a numb and extremely simple plaint in the face of annihilation, accompanied by a spare chordal accompaniment on the quartet. A lengthy fugal passage, lost, meandering and ambiguous, preludes No 8: I don’t think any nations in existence will match Syrians in their expressions of sadness, their airing of grief. In No 9: On all my travels, I’d take a book and No 10: My heart is a black lump of coal, Dove takes a leaf out of Arvo Pärt’s book in contrasting expressive cantilenas supported by the simplest and most unobtrusively minimal of accompaniments. The conclusion: My country, please wait a little longer is a numbed, shattered plea for hope. One senses, in this work, Dove striving to pare his language back to the absolute minimum, to achieve the starkest expression possible: anything else, in these circumstances, would seem an impertinence. The Sacconi Quartet has long admired the music of Jonathan Dove, speaking as it does with such directness, warmth and humanity—and to so many. We were therefore delighted when discussions between the quartet and tenor Mark Padmore resulted in a commission for Jonathan to produce for us a new work for voice and string quartet. The idea for the song-cycle In Damascus, sprang from violinist Hannah Dawson’s suggestion that the work should reflect aspects of the conflict in Syria; not because music can offer any political solution, but simply as an expression of empathy, sorrow, even outrage at those terrible events. The text is taken from prose-poems by Ali Safar that draw on his first-hand experiences in Syria, eloquently translated by Anne-Marie McManus. Out of time and the Piano Quintet are both works of intense lyricism and immense charm. To our surprise, neither had been recorded, and we were naturally delighted to be the first to rectify that omission. The collaboration with Jonathan Dove on these three recent pieces, and with pianist Charles Owen and tenor Mark Padmore, has proved among our most rewarding creative experiences to date, and we are all truly excited to be making this music available on recording for the very first time.